MONTELLO — The “no vacancy” sign glowed at the ’Tween the Lakes Motel. There were meals at the Granite Falls Supper Club, coffee at Oyster Crackers Cafe and photos snapped of the waterfalls at Daggett Memorial Park next to the Kwik Trip. This is where a quarry, decades ago, employed more than 200 people and supplied the granite for President Ulysses S. Grant’s tomb in New York City. But the 32 visitors to this Marquette County village of about 1,500 people who came from Ethiopia, Austria, Mexico, Kazakhstan and several U.S. states weren’t on vacation. 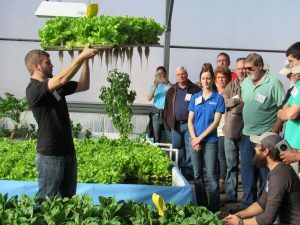 Instead, they were here for three days of master classes to learn how to harmoniously grow fish and vegetables under the guidance of Rebecca Nelson and John Pade, founders of Nelson & Pade in Montello, one of the leading aquaponics companies in the world. Aquaponics uses an integrated water system but grows fish and vegetables in separate tanks. The combined systems are enclosed in a climate-controlled greenhouse, regardless of geographical location, that allows for year-round production and prevents contamination from pollution and reduces pest, insect and disease problems. Growing Wisconsin is an annual guide to Wisconsin’s farms, forests, food and exports. It is published in partnership with the Wisconsin Department of Agriculture, Trade & Consumer Protection and features stories about the state’s top crops, livestock, agribusiness, tourism, food safety and local products. Nelson and Pade, Inc. is featured, beginning on page 14.